MLB | I ask Joboo to come. Take FEAR from bats. 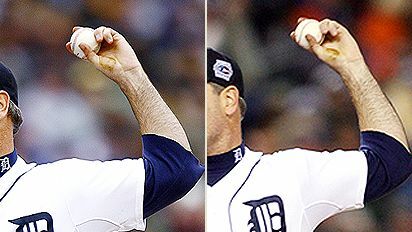 Let me first say that I don’t think Kenny Rogers’ pine tar on the hand was the key to his pitching. The Cardinals clearly couldn’t hit the man either way. The Cardinals had one hit on Rogers with the substance on the hand, and one the next seven. Rogers was rolling regardless. Not because I think it is a good move, not because it is a bad move. Not because I give a damn about the Yankees, but because I have no idea how good of a manager Joe Torre is. My gut feeling is that Joe Torre isn’t a spectacular head coach, but uh, he has all those damn World Series rings and gets to the playoffs a lot. I’m not going to say that I could coach those Yankee teams to those wins, because that would be a silly thing to say, but I do think that a whole lot of baseball managers could coach those teams to those wins. Torre has a career .537 winning percent as a manager, but a .607 win percentage in New York. He hasn’t won a World Series since 2000, and even though he has won the AL East in all of the seasons since then and has only once finished 2nd in the Division, they’ve had talent levels that other teams dream of. Not to mention, when they need to go out and add a player, they at least tend to go out and add some piece, even if it isn’t the perfect piece. Roy Williams coming to you folks once again on the Internets. Ya’ll like my catch to end the ballgame against the Rams this past week? Yeah, so what if I was out of bounds? It was a hail mary at the end of a loss, you’re lucky Roy gave a damn enough to catch that ball. My recollection of that moment in 10 years will be of the catch, who cares about the scoreboard? Gibson swings on a backdoor slider…connects…High fly ball into right field…and a lazy can of corn into the glove of the rightfielder. Great moment, he just couldn’t produce, but, to Dennis Eckersley, a job well done and I’m sure he was celebrating. Until next time, remember, I’m Roy Williams…Hey, in Roy’s world, the score doesn’t matter, baby. And when the score don’t matter, we have to look at the moments that could have mattered. Since this was just a short take, feel free to check out my longer look at last year’s USC Trojans Rose Bowl Victory.